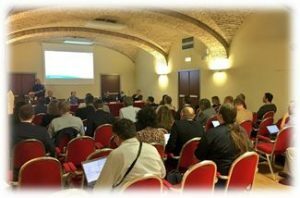 The “Data-driven Bio-economy” – DataBio project (www.databio.eu/), having reached its 10th month of implementation, with high importance developments and findings during this period, held its “1st Stakeholder Workshop” in Rome, on the 25th of September 2017. This was the first wide-scale dissemination activity of the project, gathering more than 40 experts from all around the world, attracting their active attention and participation into its project activities regarding the development and delivery of novel services and technologies in Agriculture, Fishery and Forestry by exploiting the huge potential of Big Data analysis. 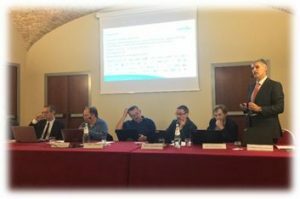 During this workshop, the project objectives, technology, exploitation potential and pilot cases were presented to the audience, all organized into individual sessions, presented by the respective project leaders. Lively discussions took place, with a lot of questions and interactions that led to fruitful conclusions and feedback for the future activities of the project. Notably, there was quite a lot of interest and ideas exchanged regarding the data acquisition and use, as well as the relevant data security measures, where there was also a long and interesting discussion regarding the business plan for the exploitation of both the individual components that are involved in the various pilot cases along with the exploitation of the various solutions that will stem from the project’s pilot cases. Finally, a number of interviews have been conducted with stakeholders coming from Europe, Africa and America to assess their interest and potential contribution to DataBio project success and results. The event was concluded with a tour in Rome historical city centre and a networking dinner to bring closer all participants and better establish potential relationships between them. More information about this event, along with the respective presentations and conclusions can be found in the project website here. DataBio (Data-driven Bio-economy) is a H2020 lighthouse project (H2020-ICT-15-2016) focusing on utilizing Big Data components and datasets to improve bioeconomy. It deploys state-of-the-art Big Data, Earth Observation, ICT technologies and existing partners’ infrastructure and solutions, linked together through the DataBio Platform. It is driven by the development, use and evaluation of a large number of pilots covering 3 major application domains (agriculture, forestry and fishery). The pilots aim to contribute to the production of the best possible raw materials from the 3 application domains to improve the output of food, energy and biomaterials. DataBio will organize a series of trainings and hackathons to support its take-up and to enable developers outside the consortium to develop new components based on and for the DataBio Platform. The project started on 1 January 2017, with a duration of 3 years and involves 48 partners and over 70 associated partners.